Natural sunscreen do’s and don’ts. People keep asking me why I don’t sell a natural sunscreen. The truth of the matter is that I use my Nightly Repair Face Serum in the morning, and although I state no claims, it has enough natural SPF from the tamanu, carrot, and other oils that I don’t need any SPF on my face most days. (See below for citation on a study I found about SPF of tamanu). If I am to spend a day in full sun I use a lab tested, mineral based high SPF sunscreen from a company I trust such as Badger Balm, with sunglasses and clothing as sun protection. A day of full sun happens for me about once a summer. At most I tend to spend an hour or two in full sun, during which I am happy to soak up the rays and feel my melanocytes getting their Vitamin D absorption on. In the meantime here are a few do’s and don’ts. 2 DON’T shmear yourself or your kids in a bunch of oil that you read somewhere online has SPF *8-10 and go to the beach all day. YOU AND YOUR FAMILY WILL BURN! For example I have seen people say things like, “Just use coconut and olive oil!”. As a pale skin person with experience in the sunburn from just shmearing oil department I can say to you, “NO! Make sure you have actual sunblock on if you are going to depend on a skincare product to protect you from the sun. 3 Any natural DIY recipe that has only oils, and no mineral blocking agent such as non-nano zinc oxide, is not to be depended upon. 5 An easy option is to add some non-nano zinc oxide (see chart in #4) to some of our body butter which is about SPF 8 and use that as sunscreen. Just warm up the body butter in the sun or however else you want and mix it in, then place in freezer to re-solidify. This is basically what I do for my own DIY sunscreen. I don’t use it for a day at the beach though, for that I call in the big guns that have been lab tested for SPF of at least 30. In case you are interested. Here is a link to the abstract about the tamanu oil study that I found. It was designed in order to assess the possibility of using tamanu oil in an opthalmic solution, since chemical sunblocks are cytotoxic (kill cells) and cause damage to the eye. First of all, itʼs like tomato/tomahto or potato/potahto. Some people pronounce the “L” and some donʼt. OK? Now we have that out of the way. 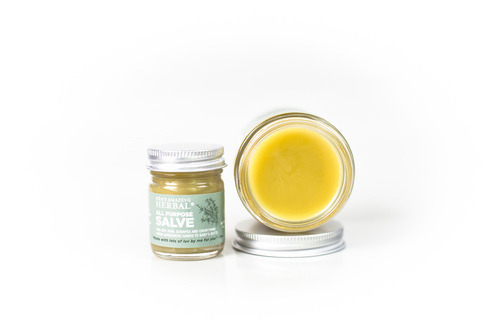 A salve is simply a natural healing ointment. There are all different types of salve, basically depending on what types of ingredients are in it. Some salves are made to draw out toxins. Some are made to promote healing. Some are made to prevent infection. A salve can provide moisture and protection for skin as well. Well made salves made with a well planned blend of herbs can work well for diaper rashes, as a first aid ointment, post exfoliation treatment, general body lotion, tattoo after-care, eczema treatment, cleaning out babies folds, cleaning ears, healing scars, burns, sunburns, bug bites, as a bug repellant, as a foot treatment, as a lip balm, a hair treatment, you name it. An herbal salve could be made just with an oil and a hardener, such as olive oil and beeswax, but it is more useful if it is also made with some type of medicinal ingredients. There are two methods that herbalists generally use to infuse the herbs into the oil. They is the low heat method, over a low flame or in a slow cooker. And there is the slower, cold infusion method. The method that uses heat is great in a pinch because it is faster and you can then custom make a salve as you need it. It does have its drawbacks though. When you heat an oil, you begin to destroy it and when you heat herbs too much you destroy their phytonutrients. Also, it’s like making soup, it’s almost always better after itʼs had more time, which an oil can withstand more of when it is not being heated. For these reasons, the slow cold infusion method is preferable to use whenever possible, and it is the method we use in our salves even though it’s a pain in the neck. Our first consideration when choosing an herb to use in a salve is that it is safe – meaning it has a very low rate of adverse reaction and does no harm – and then, that it is effective in promoting healing. Calendula: Calendula salves have been used to encourage wound healing, ease bruising and also treat infections associated with wounds. Comfrey: Comfrey is used in salves for cuts, burns, skin ulcers, varicose veins, bronchitis, and rheumatism. It is not to be overused but is a fabulous herb when used in small dosages, in a blended salve like ours for example. St. John’s Wort: Is considered to be anti-inflammatory and antiviral and is often used in salve for burns and for nerve pain. Burdock: Burdock root has been used throughout herbal history for treatment of eczema, psoriasis, candida, burns, and rashes. It is known by herbalists to be antimicrobial, anti-inflammatory, anti-microbial and regenerative. Thyme: Thyme is known to be a powerful antiseptic, antibacterial, and a strong antioxidant. Is also contributes a lovely gentle aroma to the oil it is infused in. Chickweed: It is known as an antibacterial and is known to help with detoxification of rashes and skin irritations. Plantain: Plantain is great topically for bites, and stings as well as all kinds of skin irritations including yeast and non-yeast diaper rashes. Licorice (Touchy Skin Salve only): Licorice root is known as an anti-inflammatory as well as antiviral. It is known by herbalists to be particularly useful in soothing eczema, herpes and chicken pox. We take this blend and scoop it into glass gallon sized mason jars. We use glass to avoid the leaching of toxins from plastic into the oil. We then ﬁll the jar with grapeseed oil. Grapeseed oil is our carrier oil of choice because it is highly absorbable into the skin and thus delivers the healing our herbs have to offer very nicely. It also has a neutral scent and a good shelf life compared to olive oil for example. This means we can avoid using any preservatives in our salve aside from vitamin E, which is important to us because preservatives tend to be toxic. We keep the glass jars infusing in a cold dark environment for a minimum of 6 weeks. We give them each a shake every so often to ensure a good infusion is happening. Then we strain out the oil from the herbs and dump the herbs into the compost for our home garden. Now comes the salve making part. We gently and carefully heat the oil in a double boiler, just enough to melt the beeswax. We add beeswax, and organic extra virgin coconut oil. We then ladle the warmed oil out into a pouring vessel and once in that vessel, we add a little vitamin E, and our essential oils. Once the essential oils go in, they start to evaporate quickly so its a little tricky. You donʼt want to pour so fast that it spills and makes a big mess, cleaning salve jars is a seriously annoying task. You donʼt want to give the essential oils time to evaporate either though, so this step is a bit of an acquired skill. The essential oils we use in our All Purpose Salve are Tea Tree – known for its antiseptic and its antifungal properties; Rosemary – known for its stimulating and natural preservative activity; and Thuja (cedar leaf) – known for its astringent, antiviral, and bug repellant properties. Now you have it, all our secrets. You can go make some salve of your own. Have fun. Or, you could of course just buy ours.